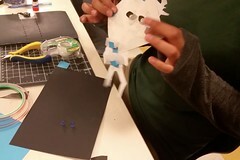 This spring we have the privilege of working with the After School Program at Lighthouse Community Charter School in Oakland to explore tinkering and making in after school time, and how it has the potential to make connections with learning in outside experiences (you can read more about the project here). Jean and I are continuing our "experiment in blogging" and sharing our reflections on how things have been going so far. Jean: As we described in our last blog together, we have been jointly analyzing observation fieldnotes in an effort to learn across our different perspectives in teaching and research. More specifically, we have been thinking about the creative ways that youth solve problems as challenges arise in their Making projects. Today we want to share what we have learned through collaborative data analysis with examples from Marceline's various Making projects. By looking at her projects and process together--both through fieldnotes and in reflection conversations--we have been particularly struck by the ways she has taken on challenges, fearlessly explored ideas for potential solutions, and engaged both materials and tools in ways that we never thought of before. As a researcher, I was struck by Marceline’s creative engineering design thinking--from her paper circuit to her tiny theater to her sewn circuit (see photos). Marceline did some interesting engineering with paper to make a circuit 3-D, to move scenes in her theater, and to design the armature of a sewn-circuit ballerina. Yet Lianna is the one who helped me notice how Marceline’s ideas became more complex over time. 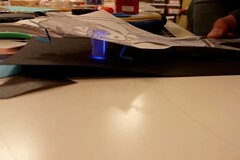 Marceline engineers paper in order to lift her drawing of a cartoon character (Marshall Lee of Adventure Time) above her circuit so that the project could take on a 3-D feeling. 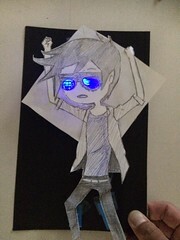 She also cut and folded paper to focus blue LED lights Marshall’s sunglasses while hiding the circuitry beneath. Marceline undergoes an iterative design process to engineer the movement of paper scenes within the contained space of her tiny theater box without necessitating folding paper or moving scenes in and out of the box. Marceline creates a wooden skeleton to support the fabric body of a ballerina she wanted to use as the base of her sewn circuit project. While reflecting on learning together, Lianna brought up the intentionality of engaging youth with activities that build on each other over time. Each project has multiple entry-points so that any new learner can make, but for returning students, these projects are also meant to build on what was learned in previous weeks. My conversation with Lianna made me realize how Marceline’s starting point was a paper-based activity that facilitated her process of thinking about how flat paper can be used to develop 3-D forms. This experience formed the basis for how Marceline engineered with paper in her tiny theater project; Paper didn’t just form the surface on which to draw her school images, but similar to her paper circuit explorations, Marceline saw the potential for paper to influence the internal architecture of space in the box as well as take on specific movements from scene to scene. 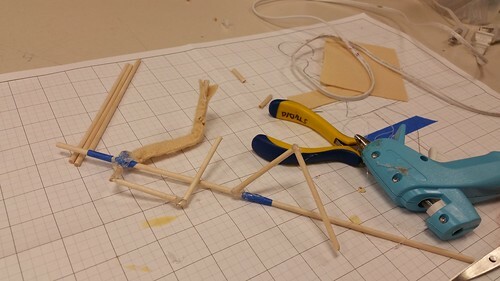 This way of using paper as engineering medium and tool then gave life to how she approached designing and building a 3-D ballerina for a sewn circuitry project. Graph paper was used to map out the physical dimensions of her ballerina, taking ideas from a flat image toward constructing a 3-D structure. Lianna: Complexification of ideas and thinking over time is so valuable to me as part of the tinkering process; it’s such a strong indicator of learning based on past experience, and I’m so glad our conversations are drawing these ideas out! One way the fieldnotes have been valuable to me has been the opportunity to get a glimpse into a student’s process during the moments when we aren’t there as facilitators. For example with Marceline’s tiny theater project I was one of a few facilitators in the room who helped her at various points. I only saw bits and pieces of her process of figuring out how to move her paper scenes within the box. Reading through the fieldnote allowed me to get a fuller idea of not only how her ideas changed over time, but also ways in which we as facilitators can help (or hinder) the students we work with. The fieldnote documents several occasions of facilitators stepping in, offering a suggestion, then stepping out to allow her to continue working. Marceline was able to try several suggestions and choose which ones she wanted to test and which she could pass on. Some were more closely related to her original idea, but others steered her in a really different direction. While I think the process of facilitators stepping in and out is a great one in general, it did make me wonder if at some points we over facilitated her process. As a facilitation team, we didn’t pay enough attention to each other and how often we were intervening. It also made it hard to know which ideas were hers and which were ones that came from facilitators. Because we could read and reflect on the fieldnote as a team, it gave us a chance to go back and discuss our role in how we work with the students. This gets back to the complexity of Jean’s original point. In both our work and in students’ work, there are no “right” answers about how we approach them. I think it’s still an open question of “did we over facilitate?” that we can examine. By continuing to be reflective around the work we do, it helps us to grow as facilitators and, more importantly, provide the best experience for the youth we work with. Jean: I am glad to know that research fieldnotes and our conversations together can serve as useful supports for reflecting on and improving teaching practice. The insights that Lianna, Sarah, and other afterschool educators have shared with me definitely impact how I see and make sense of student learning. It will be exciting to see how our collaboration continues to support deeper analysis of learning and pedagogy as we begin analyzing fieldnotes, student work, and interviews this summer!